London Greens have sent in questions for London Assembly candidates to answer. So I thought I’d post my responses here. The questions cover a range of issues covering the Night Time economy, voting systems, campaign messaging, positive discrimination, young people, housing, narrowing the gap between highest and lowest paid, Brexit and protecting green spaces. There was a strict limit of not more than 100 words per question on average. And here are my answers. The Economy Committee reportRewrite the Nightthat I lead on as Economy Chair last year, looks in detail at the issues faced by grass roots music (and other creative) venues. I really like the way the Mayor is supporting inclusive culture across the city including in outer boroughs and not just in the honeypot centre. I am making sure that this report recommendation is included in the London Plan: “The Mayor should require boroughs to consider the need for dedicated space to showcase the work of artists and musicians in Supplementary Planning Guidance”. As Chair of the Economy Committee last year, I lead a scrutiny into the future of Culture and the Night Time Economy. Our report Rewrite the Night made many recommendations to the Mayor. In particular that workers at night should be paid the Living Wage. I got the mayor to publish new data in to working conditions at night revealing that more people are working for less than Living Wage at night. I’ve questioned the Mayor on this and yesterday responded to a report from the Night Time Commission that failed to mention underpaid night time workers. I led the Economy Committee response to the Mayor’s draft Culture Strategy and made a Green Group response that focussed on good work standards and grass roots culture. You can also watch my questioning the Mayor on the Culture Strategy. First Past the Post (FPTP) elections are tough. They work on a binary choice between the two biggest parties in any election. The Assembly election is different. The constituency vote is FPTP and we won’t win those seats. 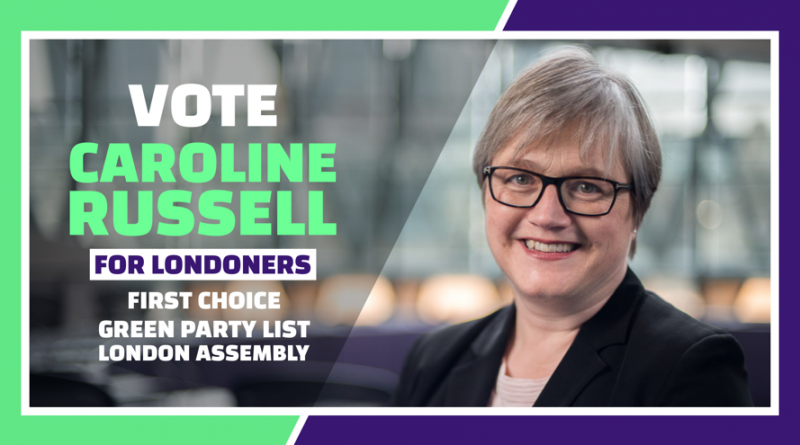 However we have come third in the Mayoral election in 2012 and 2016 and we have consistently won two seats on the Assembly via the proportional Party list vote. When people know their vote will count they will vote Green. Our job is to show elected Greens are effective, so Londoners vote for more of us. The campaign messaging belongs to London Green Party and not to any one candidate. Having said that, I hope that we will build on the record of work that Sian and I have created so that Londoners have confidence in voting Green Party on the party vote ballot paper. I think we need to focus on voting for “the Green Party” and not the colour of a ballot paper as in previous years. I really like the formulation of “at least” one woman and “at least” one BAME person in our selection framework. It is not about quotas but it does ensure that our list of candidates in in 2020 is as representative of Londoners as possible. The most important thing about effective Green Party campaigners and elected people is that we are good listeners and that we bring Londoners voices in to our Town Halls and City Hall. Assembly Members (AMs) are elected to scrutinise the work of the Mayor of London. However we can ensure the Mayor’s policies help campaigners standing up to protect green space in London boroughs. I will be giving evidence to the Examination in Public for the London Plan on greenspace and biodiversity amongst other matters. As an Islington councillor Islington I’ve made sure greenspace workers are employed on proper contracts with rights to sick and holiday pay. I’ve also made sure that community use of parks is protected despite the impact of austerity meaning parks need to create some income. As Chair of the Assembly Economy Committee last year, I oversaw a scrutiny on the financial health of Londoners. After speaking with young people and seeing the work of organisations like MyBnk, we made several recommendations in our Shortchanged report to the Mayor about supporting the financial well-being of young people. On our recommendation, the Mayor held an event last Autumn bringing together the organisations supporting the financial health of young Londoners. You can read more about this work here. And obviously I am a huge fan of the Young Greens and the 30U30 scheme, enabling so many people to become such impressive campaigners. I am working on a scrutiny as Environment Chair looking at solutions for cold, damp and mouldy homes. As a councillor in Islington it has been shocking to see the way that a combination of factors like new plastic windows, overcrowding, lack of ventilation and structural design of flats has lead to an epidemic of condensation and black mould. It is shameful that public sector housing is left in this state and that residents are even made to feel guilty for breathing, cooking and washing their clothes through thoughtless advice to put lids on saucepans and avoid hanging clothes to dry indoors. We have visited Thamesmead where Peabody have come up with effective multi measure affordable retrofit. I hope our report will help social housing providers to tackle mould and condensation making all homes fit to be lived in. If you have experience of mould and condensation contribute to our report via TalkLondon. The London Living Wage came out of work by the Assembly pushed by Jenny Jones and Darren Johnson. In the Green Group budget amendment this year we propose that the Assembly explores whether a four day working week (on full pay) would help the productivity of the organisation and the well being of workers. My work as Chair of the Economy Committee last year on financial health has at my request been followed up this year examining the impact of Universal Credit on small and micro businesses. I campaigned hard to Remain and continue to campaign to expose the harms of leaving the EU. I sit on City Hall’s EU Exit Working Groupand have made sure that EU citizens’ voices have been heard and that the impact of leaving the EU on small businesses is understood and assistance given. Last week I raised with Nick Hurd, Minister for London the precarious situation of micro businesses preparing for EU exit. I’m proud that it was a Green Group motion that got the Mayor to speak out for a People’s Vote. Overcrowding is increasing and it is unquestionable that we need more homes in London for social rent. However it is crucial we build on brownfield land first rather than using green spaces that are so important for our mental health and well being as well as for protecting biodiversity and providing resilience against climate change impacts like extreme rainfall and flooding. My recent report on Farming in the Green Belt found that farmers find it hard to get access to land for a decent period to enable sustainable farming practice, this is probably a consequence of land-banking for future development.